The nation's most expensive Senate race ended with Republican incumbent Sen. Pat Toomey defeating Democrat Katie McGinty in Pennsylvania. Toomey won the race by a two-point margin with 49 percent of the vote to McGinty's 47 percent, according to the Associated Press. Toomey faced an uphill reelection fight after capturing the Senate seat in the 2010 Tea Party wave. Democrats held a nearly one million member registered voter advantage over the Republican Party in April 2016, the most recent data available, as the campaign kicked off. The race has long been seen as crucial to determining the Senate majority in 2017. Democratic super PACs, unions, and other outside groups spent heavily on attack ads against Toomey early in the campaign and ended up spending a total of $64 million by the end of the race–$10.5 million more than Republicans spent on the race, according to the Center for Responsive Politics. Despite her advantage in spending and voter registration, McGinty was consistently unable to pull away from the Republican incumbent, even though early voting showed him with some of the highest disapproval ratings in the country. McGinty was plagued by a series of pay-for-play scandals stemming from her stint as a lobbyist and time directing the state's Department of Environmental Protection. She took lucrative jobs with a foreign windmill company and other energy businesses that she had worked with while on the government payroll. Toomey ran his campaign as a moderate on gun control, winning anti-Second Amendment activist Michael Bloomberg's endorsement, while criticizing McGinty's support for sanctuary cities on immigration. He also avoided the question of Donald Trump, refusing to publicly endorse or oppose his party's presidential nominee. She held a two-point advantage over Toomey, according to the Real Clear Politics polling average, roughly equal to the gap between Donald Trump and Hillary Clinton before the election. Democrats entered election day aiming to flip five GOP seats. 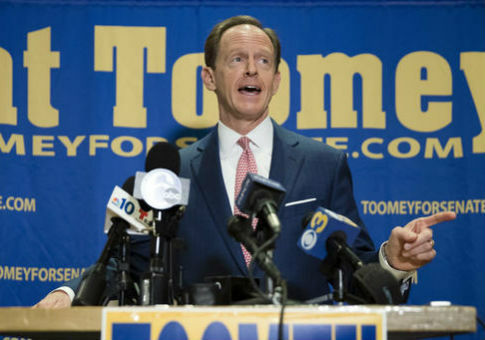 Toomey's victory made it nearly impossible for the Democrats to reclaim the Senate, which has been under Republican control since the 2014 midterm elections. This entry was posted in Politics and tagged 2016 Election, Katie McGinty, Pat Toomey, Pennsylvania, Senate. Bookmark the permalink.